Can you believe that it hasn’t even been a year since Richard Crossley and Princeton University Press unleashed The Crossley ID Guide: Eastern Birds on the birding public? Actually, a fair accounting of this innovative book’s already storied history must include many months of fervent speculation. I recall the words “game-changer” and “unprecedented” bandied about as enthusiasts across North America pondered where to place their Sibley Guides to make room for the new ruling reference guide. But the bird watching world still seems to spin along the same axis as it did last year, and we in the States still seem to turn to the same birding bibles we did before. The game didn’t change. Few others online, including Corey, were as enamored with The Crossley ID Guide as I was when the book initially came out. But has time vindicated Crossley’s bold vision? A birder I respect recently asked on Facebook whether the Crossley Guide fizzled out. Fizzled? The question itself surprised me so much that I wanted to share my own feelings about this book. 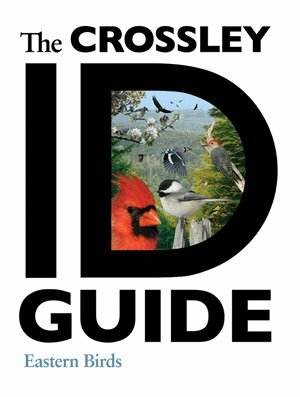 Simply put, I genuinely love The Crossley ID Guide. Its premise enchanted me before its publication and its kaleidoscopic execution continues to dazzle and inspire every time I browse the plates. While other guides tend to present their revered subjects with sobriety and economy of expression, the Crossley Guide goes way over the top in delivering fantasies of flight, surreal landscapes where single species flourish in impossible assemblages of seasonal plumage. Any excellent reference guide, painted or photographed, may fairly be described as art, but how many edge into the abstract? I applaud Crossley and Princeton for releasing a reference guide that excites the imagination, but I also appreciate the educational value of their unlikely approach. Back in September, a friend and colleague who teaches at SUNY Geneseo brought his Vertebrate Biology class to the Braddock Bay Bird Observatory to observe some master bird banders at work. I participated mostly as color commentary, but I was also interested in finding out which students were genuinely interested in or knowledgeable about birds or could become so. Since I didn’t dare rely on either my own knowledge of birds or personal charisma, I brought a secret weapon: The Crossley ID Guide. Let me further set the stage by explaining that the predominant species in the nets that day was Blackpoll Warbler, record waves of which were passing through the area. Fall Blackpoll Warblers, as you undoubtedly realize, are not only terribly drab but are also virtually impossible for the uninitiated to separate from many other fall warblers. Frankly, fall warblers may be one of the main arguments against bird watching. But imagine how educational the experience became once I passed out the Crossley Guide, which depicts the entire life cycle of Setophaga striata on one magical plate. On face after face, indifference was replaced with interest, if not wonder. Students browsed the book, sharing different pages and pointing out the birds they knew or wanted to know more about. At least a couple seemed interested in taking it home! Like it or not, The Crossley ID Guide is still a novelty. Experienced field ornithologists can argue where this book deserves to be placed in the pantheon of reference and field guides. Others can judge exactly which level of birder best benefits from those rich, cluttered plates. I still see this book as something very special, an ambassador piece that might inspire many an avian obsession. After living for nearly a year with the Crossley Guide, what do you think? I’m glad you posted a follow-up on this. I am happy to report that I continue to use the Crossley guide as it was intended…as a workbook for studying birds. It’s kind of like using Kaplan test prep…giving you all the tools you need to be successful on test/field day and guaranteeing you’ll do better by using its method. I studied the Crossley guide a lot when preparing to see fall warblers at the Midwest Birding Symposium. I felt my study paid off when I started seeing the color of the Blackpoll feet and knew instantly what I was looking at. There have been occasions where I have used the Crossley guide to help confirm an identity of a species after I have seen it in the field, usually along with the rest of my field guide arsenal. I’ve never used it as a field guide in the field. I’m still looking forward to the day when we have an tablet device with a field guide app that includes video. Maybe it would show video of our friends from Cornell teaching a brief segment on how to identify that species and distinguish it from similar species. The technology is certainly here, but it will just take the money to bring it all together. It seems to me that there’s a surfeit of field guides, since the advent of digital photography and the internet. The new Stokes guide came out just recently, for example, so I think there’s about one new field guide per year. However I live in Western North America, which is apparently the bad part of town birding-wise, so fortunately I don’t have to have an opinion about the Crossley guide. Heck, I even have to work hard to find greeting cards which don’t have Cardinals and other alien species on them. But seriously, when Crossley gets around to writing a field guide for my part of the world, I’ll definitely have a look at it. For the time being I still have room in my budget for bird books. I’ve come around to it more than I did when it first came out. I don’t think it’s quite the game-changer it was made out to be, but it is a useful book in its way and Crossley’s style works much better for some species – namely ducks, shorebirds, raptors and open-country birds – than it does for others, like most of the perching birds. But in the end, it’s sitting on my coffee table right now along with Sibley and a couple other books as one of the first few I reach for when I have a question about an identification, so that’s a testimony to its longevity and usefulness. Crossley deserves credit for trying something completely new and pretty much succeeding at it. I look forward to seeing the next few books he’s said to be working on. One of the early reviews I read suggested its use as a primer before going to a new area to get a picture in your mind’s eye of unfamiliar birds you may see. I’ve used it this way several times and while I can’t quantify it, I think the results were positive. I also use it as a second opinion to the Sibley that lives in my car’s glove compartment. I don’t regret buying Crossley, but if pressed to reduce my collection to one ID guide, it would be Sibley. I’ve come across too many ID’s (mainly of passerines) that I would have gotten incorrect using Crossley alone. In the end, I’d rather just keep my entire shelf of 40+ bird books, though! The Sibley Guide is still my go-to guide, both for studying at home and identifying birds in the field. However, I have made regular use of The Crossley Guide to prepare for birding trips and to identify birds from photographs. Sometimes it shows birds in ways that the standard field guides don’t or provides a better sampling of real-world plumage variations. I’ve only looked the Crossley guide over a few times because I live in the West. I hope he decides to create a Western version because I love the idea of showing the bird in all different ways in its environment. I find that Sibley is still my birding bible, though I often reference other guides as well, Crossley included (especially if I have an image of, say, the back of a sparrow and I am trying to remember what sparrow it was). My opinion hasn’t really changed, I still love it. My main complaint is that I haven’t had the cause (due to lack of birding) or time to really get into it and study like I’d like. I can’t say that about every field guide. As a beginning birder I have looked at all of the guide books on the bookstore and library shelves, I have also purchased most of them as they all have differences. My main guide for the field is my Peterson, but if I want a confirmation or I am unsure of what I have seen or photographed then the Crossley ID Guide is my go to book. I had read a lot of reviews of the Crossley ID guide, and had to trust in them as I wasn’t able to find a copy of Crossley at the local libraries or book stores, I was not disappointed with my purchase. I don’t own the Crosley guide yet and will certainly purchase it once I am back in North America. It does look like a brilliant book. Does it allow you to identify birds you were not able to identify with the other ID guides? Can someone who has used it in the field tell me if this the case? @Jochen- It certainly offers more looks at more species from all sort of angles. I’ve never used it in the field, though I have used it to confirm IDs for less than ideal field experiences after the fact. So, I guess the answer to your question is “probably”. As a relatively new birder, I go back and forth on which guides I trust the most. I carry Sibley East in the field, but Crossley rapidly became the resource I checked when I got home when I had difficult field sighting. Simply put, Sibley remains the best for ID of well-seen birds or solid field marks, but Crossley deliberately imitates real field conditions by putting fly-by’s in the background, or awkwardly placed birds on branches, or rear views only. I find he really understands not how birds look ideally (as Sibley does) but how they look really. It is a quirky book, and the species descriptions vary in usefulness (although they are never dull; e.g. Ruddy Turnstones are the “sausage dogs” of shore birds). Others have said it already, but it would make a great ebook, especially for iPad.